Many years ago I had a blog going of our 'rehab' project that we decided to take on. (However, due to a lack of time, I didn't keep the blog current.) Over the course of our marriage, my wife and I did a few 'rehab' projects. Yes, the houses advertised as "TLC" or as my wife calls them. Terrible Living Conditions. Yes, our current house was one of them. We bought it over five years ago from a bank and the house was in slightly run down, ok, terrible condition. I won't go into the entire story today but through a tremendous amount of work and God's grace, the house looks nice. Every year we bought trees and decorations for the yard and before we knew it, we were consumed with creating a beautiful front yard. 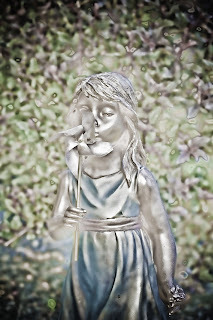 Each statue represented someone or something in our life. 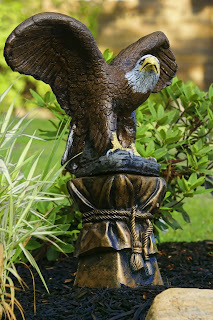 The eagle is my favorite bird and we recently added the base for the eagle to rest on. The little kids represent our oldest grandkids. 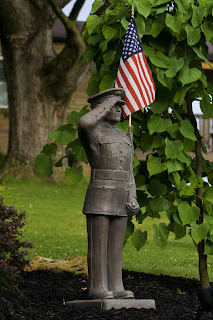 The marine represents our son in law and is a tribute to all those who serve this great country. 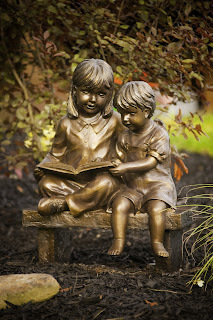 We have many other items and trees in the yard and over time, I will post them for everyone to enjoy. Never in our wildest imagination did we believe the beauty that would develop in our front yard. As always, get out and enjoy the beauty of Life!